OK, I know I'm not the only person who's been grillin' for a crowd and not had enough room on the grill for all the meat. Don't you hate that? You have to cook a little meat then move it some place to stay warm while you finish the rest. Worse yet, everyone else starts eating while you're still chained to the grill! Well, if you had the Weber Ranch Kettle 60020 you would've had plenty of grill area to cook an entire cow! IT'S HUGE! 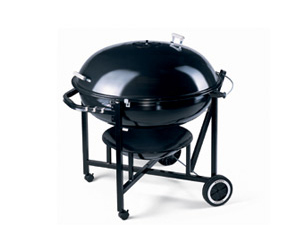 It measures 42″ H x 37.75″ W x 44.75″ D and it features OVER 1,000 square inches of grilling surface! It's wide enough to set up multiple cooking zones for direct and indirect cooking at the same time! Did I mention it's HUGE? It's a little pricey (between $800 and $1,400 depending where you get it. SHOP AROUND! ), but it would be a great investment for any of us who love to grill huge amounts of meat. Hell, you could even cook those giant mastadon ribs from The Flintstones if you wanted to! Check out the rest of the specs here. See more great Sven & Angus holiday gifts on Amazon HERE! TM & ©2017 Rum Runners. All rights reserved. Vegans taste like chicken. That's copyrighted, too, so don't get any ideas. Hate-mail: meat (at) cowsaredelicious.com.